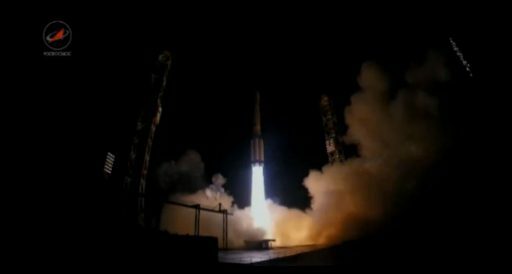 Launch Success: Khrunichev, the manufacturer of the Proton Rocket and Briz-M Upper Stage, confirmed that all launch events were carried out a expected and the Ekspress AMU-1 communications satellite was separated from the upper stage at 6:43 UTC on Friday, marking a successful conclusion of the final Russian launch in 2015. Orbital data is expected later on Friday and will be published in a separate launch update. 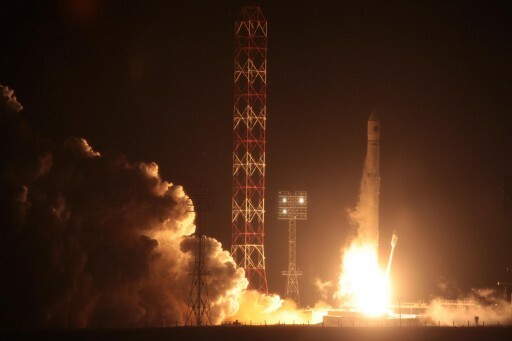 A Proton-M rocket climbed into the night skies over the Baikonur Cosmodrome on Thursday, starting a long overnight mission to deliver the Ekspress AMU-1 communications satellite to orbit and close out a busy year of launches from Russian Cosmodromes. 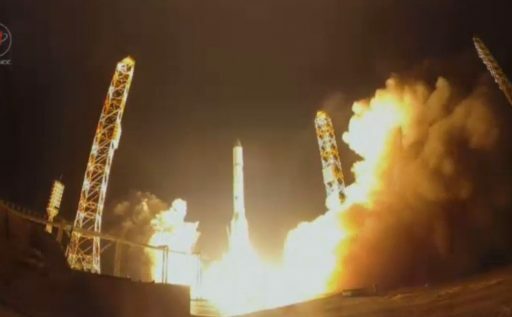 Proton-M blasted off at 21:31 UTC and fired its three stages to deliver the Briz-M upper stage to a sub-orbital trajectory less than ten minutes after launch. Briz-M is expected to follow a five-burn mission profile to gradually raise its orbit and put the Ekspress AMU-1 satellite into a Geostationary Transfer Orbit nine hours and 12 minutes after launch. The year 2015 saw at total of 29 Russian launches as the country maintains its leading position in the space launch business ahead of the United States with 20 missions and China with 18 space launches, but at least one more to come before the year is out. European rockets made 9 launches this year while India flew five orbital missions and Japan conducted four launches, including its first fully commercial mission. 2015 was a bit of an up-and-down for Russian spaceflight – one launch failure was suffered by the Proton rocket and the Soyuz family also had a tumultuous year with two unsuccessful missions. 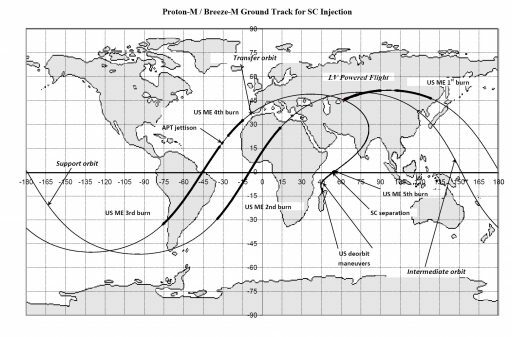 Proton, making eight flights this year, failed back on the MexSat-1 launch in May when a repeat failure occurred involving the third stage steering engine that had also claimed the loss of an Ekspress communications satellite in 2014. Looking at the positive, Proton’s failures illuminated a design issue with the turbopump of the third stage steering engine which had caused a failure in the 1980s, but went unnoticed due to a lack of sensors and could have led to even more failures if not uncovered by Proton’s recent troubles. Proton returned to flight in August and successfully flew out the remainder of its 2015 manifest comprised of four government-operated missions and four commercial launches handled by International Launch Services including the ill-fated launch of MexSat-1. 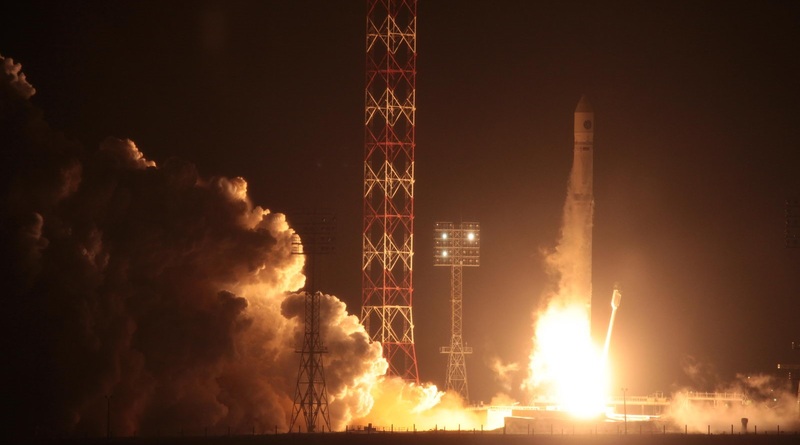 All satellites launched by Proton this year were dedicated to communications, either on the commercial market or under operation by the Russian military. Soyuz, Russia’s workhorse for satellite launches, crewed missions and cargo flights to the International Space Station, again juggled a busy manifest this year with launches from the Baikonur Cosmodrome, Russia’s Plesetsk Cosmodrome and the rocket’s equatorial launch site in French Guiana under oversight of Arianespace. 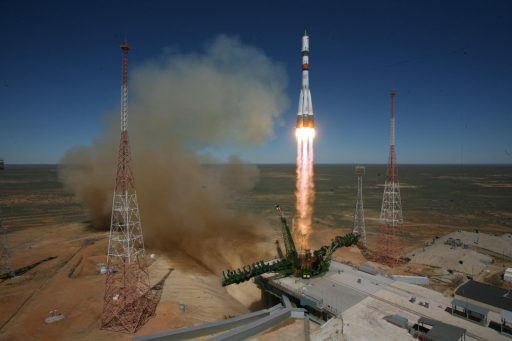 In its modernization and transition to the improved Soyuz 2 version, the rocket ran into a snag in April when the second overall mission of the Soyuz 2-1A rocket with a Progress spacecraft suffered a major problem at engine shutdown. Progress M-27M, set for a cargo flight to ISS, was a complete loss and a painstaking inquiry got underway to uncover a complex failure mechanism not encountered earlier because of the specific frequency-dynamic characteristics of the Soyuz third stage with Progress sitting atop. 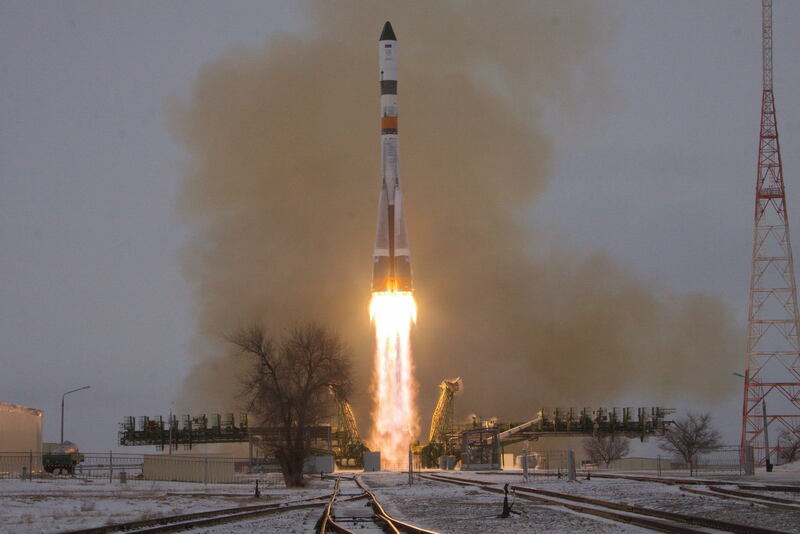 The 2-1A – Progress combination returned to flight earlier in the week with a successful launch to ISS, also marking the debut of the improved Progress MS spacecraft. 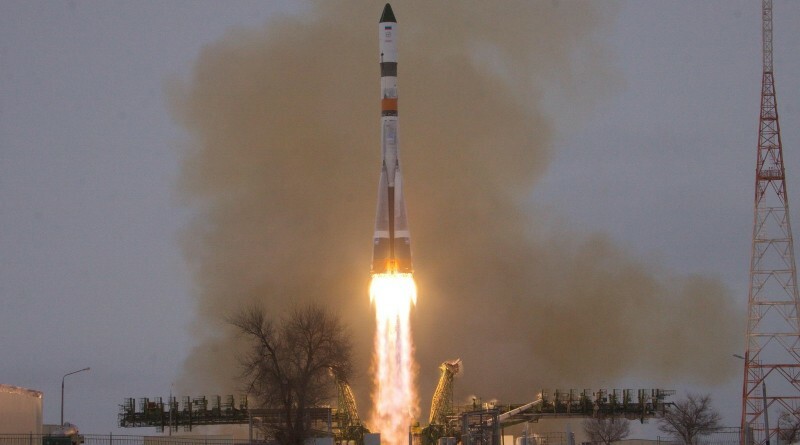 In 2015, the Soyuz family conducted nine flights dedicated to the human space program – launching four three-person crews to ISS and keeping up a steady chain of supply missions to the International Space Station; five missions were dedicated to the military and three launches from South America for the European Galileo navigation constellation. Soyuz 2-1v, a highly modified version of the Soyuz suitable for small payloads, conducted one flight – ending in a partial failure at the point of spacecraft separation which could not be accomplished due to a defective separation mechanism leading to the untimely demise of the Kanopus ST submarine-watching satellite while a secondary payload was released into orbit. Rockot, Russia’s light-lift vehicle conducted a pair of flights in 2015 delivering communication satellite trios and the venerable Dnepr rocket conducted one mission for South Korea. There was one lone Zenit mission lifting a Geostationary Weather satellite as the powerful launcher finds itself in the midst of the Russian-Ukrainian conflict and may never see flight again. 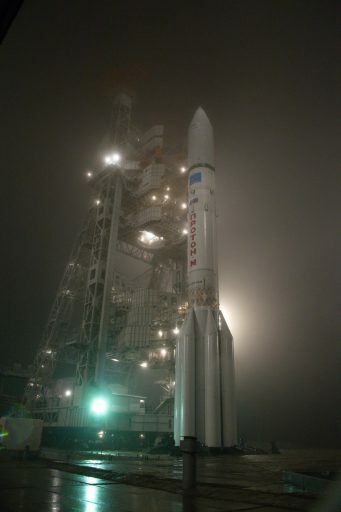 Counting down to its year-closing mission, Proton-M came back from a weather-related delay on Wednesday. After initial power-up, the rocket and its Briz-M upper stage went through detailed testing and received their flight software while teams at the launch pad set up systems for a three-hour propellant loading sequence picking up at T-6 hours. A total of 622 metric tons of toxic hypergolic propellants – Unsymmetrical Dimethylhydrazine and Nitrogen Tetroxide – were loaded into the three-stage rocket while Briz-M had been loaded with nearly 20 tons of hypergolics in the days leading up to the rollout of the rocket. With Proton fully fueled, the protective Service Structure was retracted from the 58-meter tall rocket and all engineers departed the pad – seeking shelter in the nearby launch bunker or retreating to safe distance. 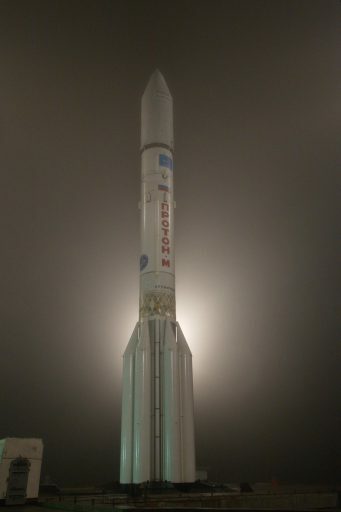 The Ekspress AMU-1 satellite, built by European satellite manufacturer Airbus Defence and Space, switched to battery power and the Proton rocket followed suit when heading into its automated countdown sequence. A last health check was conducted and Proton pressurized its tanks, leading up to the ignition of the six first stage engines. 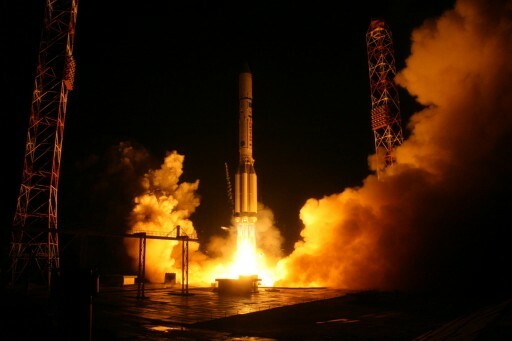 Proton came to life as its RD-275M engines throttled up to a liftoff thrust of 1,014 metric-ton-force for a thundering liftoff at precisely 21:31:19 UTC. Not much could be seen of the ascending rocket except the bright orange glow of its engines, quickly disappearing in low clouds hanging over the Baikonur Cosmodrome. The 21-meter tall first stage with its characteristic outboard fuel tanks burned through 3,600 Kilograms of propellants per second to send the Proton on its way, passing Maximum Dynamic Pressure 62 seconds into the flight. Hot staging between the first and second stage was initiated at T+1:58 as the second stage received the command to ignite its engines. A split second later, the first stage shut down its six engines and, at the same time, the stage separation mechanism was fired to free up the second stage and push the first away with the exhaust of the second stage engines. Powered by four 599kN engines, the second stage of Proton is 14.5 meters long and consumed 156,100 Kilograms of propellant over the course of a burn of 3 minutes and 27 seconds to take the launcher out of the dense atmosphere. Call-outs from the launch bunker indicated Proton was on course and showing good performance throughout the operation of the second stage. For the separation between the second and third stage, Proton also used hot staging – igniting the RD-0214 vernier engine at T+5:24 followed by the shutdown of the second stage at T+5:28 with the simultaneous separation of the stages. Two seconds later, at T+5:30, the RD-0213 main engine of the 6.5-meter long third stage ignited and soared up to full thrust of nearly 60,000 Kilogram-force for a burn of four minutes. Shortly into the firing of the third stage, Proton jettisoned its protective payload fairing – revealing the Ekspress satellite for the rest of its long ride to orbit as the vehicle had gained sufficient altitude where aerodynamic forces were no longer a concern. Guzzling down 46 metric tons of propellant, the the third stage shut down its main engine at T+9 minutes and 30 seconds followed by the shutdown of the four-chamber vernier at T+9:41. An instant later, the Briz-M Upper Stage was separated into a sub-orbital trajectory from where it will take the Ekspress AMU-1 satellite into a Geostationary Transfer Orbit over the course of a mission of nine hours and 12 minutes. The flight follows a typical five-burn profile with the first burn to enter a Low Earth Parking Orbit, the next three burns to raise the apogee and the final burn to bring up the perigee and decrease the inclination. 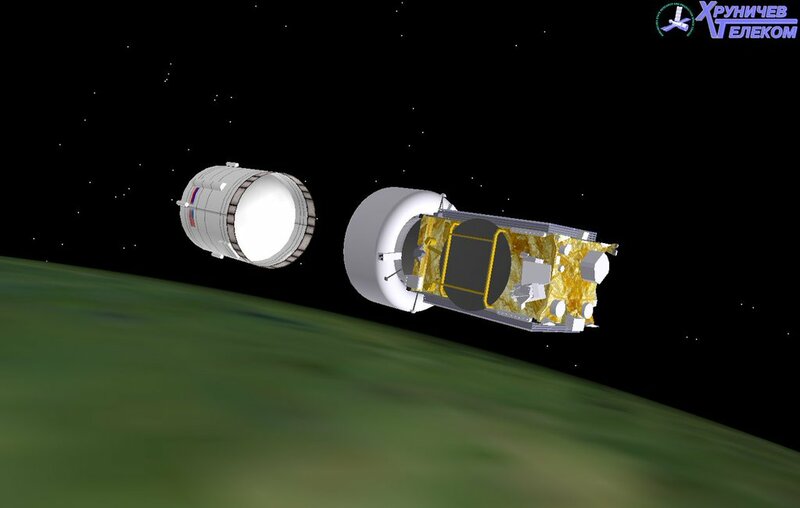 Beginning its five burn mission, the Briz-M upper stage will ignite its S5.98 engine after a very brief 94-second coast to conduct a burn of four and a half minutes that puts the stack into a circular Low Earth Orbit 182 Kilometers in altitude for a coast phase of a little over 50 minutes to set up for a long burn on the ascending node of the orbit with a duration of nearly 18 minutes to raise the apogee of the orbit to 5,000 Kilometers, placing the apogee passage close to the equator. Next is a coast phase of nearly an entire orbit so that the next burn at T+3 hours and 28 minutes can again take place around the perigee of the orbit, on the next ascending node, to continue raising the apogee to reach Geostationary Altitude – aiming for an orbit of 440 by 35,815 Kilometers inclined 49.1°. The third and fourth burn are conducted as a pair, amounting to a total of 17.5 minutes, only separated by a brief intermission at T+3 hours and 40 minutes for the separations of the spent Auxiliary Propellant Tank. After the conclusion of the fourth burn, Briz-M will coast for over five hours to be able to climb all the way up to the apogee of the orbit for the final burn of the mission starting eight hours and 53 minutes after launch and lasting 6.5 minutes to serve as a perigee-raising maneuver and a plane-change, reducing the inclination of the orbit. Ekspress AMU-1 is targeting an insertion orbit of 4,360 by 35,793 Kilograms at an inclination of 22.5 degrees. Spacecraft Separation is expected around nine hours and 12 minutes after launch, at 6:43 UTC on Friday. The Ekspress AMU-1 satellite was built by Airbus Defence and Space for operation by the Russian Satellite Communications Company to expand its services to cater to the growing needs of the Russian digital entertainment market. The 5,700-Kilogram satellite carries a Ku/Ka-Band payload of 71 transponders delivering coverage beams to the European portion of Russia and surrounding eastern European countries and to Sub-Saharan Africa.